Compact and lightweight; Excellent image quality; Fast; RAW image format; Good low-light performance; Manual focus ring; Gorgeous, large display. Detail loss due to excessive noise reduction; Pop-up flash is delicate; Slippery body makes it hard to get a grip. Ever wondered why image quality in point-and-shoot cameras has not improved considerably over the last couple of years? Especially in low-light / high-ISO shooting? That's because manufacturers have been simply cramming more and more pixels onto a tiny image sensor (barring a few exceptions, like the Canon G series). Generally speaking, small sensors perform very poorly when it comes to noise. In fact, sensor size (apart from evolution) is the reason why SLRs fare siginificantly better in noise performance. An ISO 1600 shot from an SLR will likely match the results from a point and shoot at ISO 400. But DSLRs are bulky, and difficult to lug around (approx 1 kg vs say, 250 grams for a compact point-and-shoot). A couple of large sensor point and shoots do exist, but now, with the RX100, Sony has gone a step further — putting in what is the second-largest sensor in a compact form factor. The record for the largest is also held by Sony, with the even more expensive Cyber-shot DSC RX1 (which uses a pro-SLR sized "full frame" sensor). But let's come back to the RX100. On paper, it appears to be the perfect carry-in-your-pocket camera. Apart from the price tag, the RX100's claims to fame are the large 1" sensor, which outputs an impressive 20.2 mp, 3.6x optical zoom (not much, but certainly fine for a pocketable camera), f/1.8 aperture at the wide end (sadly, the aperture narrows down as you zoom, but this is a compromise for compactness), a control dial around the lens, a 3" screen, and a USB rechargable battery. The DSC-RX100 is just 1.4" thick, and sports an all-aluminium body with a black graphite matte finish. At just 240 grams, it can be easily carried around in your pocket. The build quality is, overall, really solid (barring the somewhat delicate flash). The camera sports a 3.6x Carl Zeiss Vario-Sonnar T* f/1.8-f/4.9 lens with a focal length equivalent to 29-105 mm. If one had to pick on the optics, the narrower aperture towards the tele end of the zoom would be the reason. Zooming can be controlled in two ways — using a point and shoot styled rocker near the shutter release button, or via the ring around the lens, just the way you zoom in an SLR. This control ring is also used for manual focus, changing aperture and shutter values, and for various picture effects (according to user-assigned function). The lens cover automatically opens or closes when the camera is switched on or off. A Xenon flash at the top left pops out automatically when required, or according to user setting — but it cannot be extracted by a mechanical button. The spring-action mechanism here uses a folding stalk, which seems to be a little delicate, so you will need to handle it with care. The placement of the flash is good: It is away from the shutter button on the right, so there’s less of a chance of your fingers getting in the way. Two (stereo) microphones are located at the top (complementing the impressive video recording; we'll come to that later), as well as the power button and the mode dial (to select shooting mode). The shutter button is nicely recessed into the body towards the front, and it is encircled by a spring-loaded zoom lever. The back is almost completely dominated by a large 3" 4:3 Xtra Fine LCD screen with resolution of 1280x960, yielding a massive pixel density of 533 ppi. As you might expect, the images are very crisp, and the colours appear natural. The camera uses Sony's WhiteMagic technology so the panel is bright enough to be comfortably used outdoors. There is a level gauge feature in this camera, using which you can ensure that the camera is horizontal. You can assign any shortcut to the Fn button (for example, switching to ISO value selection), so you don’t have to get inside the menu for it. A rubberised thumb-rest helps towards a better grip while shooting. The camera has dedicated Movie Record, Play, Menu, and Options buttons. The jog dial, with a centre button, lets you access various functions, and cycle through recorded content in playback mode. This camera supports Sony's MS Pro Duo as well as SD, SDHC, and SDXC memory cards. One of the commendable decisions Sony took a couple of years back was support for the industry-standard SD cards apart from the company's proprietary MS format). The slim Li-ion battery is a 3.6V Sony N-type NP-BX1 with a typical rating of 1240 mAh. It can only be charged when it is in the camera (via the USB cable). The threaded tripod mount socket is made of metal rather than plastic. The DSC-RX100 is literally crammed with useful features. The Sony BIONZ image processor on this camera is the same as on its Alpha-series DSLR cameras. The control ring, apart from the manual focus function, takes on other functions as well. You can get wide-angle macro shots of objects as close as 1.9". The Intelligent Auto Adjustment mode worked reliably in our tests. This puts the camera in autopilot, where it decides the parameters for the best shot. We could actually observe the camera changing the scene mode from Backlight to Twilight as you move it from a bright to a dark subject. Then, there is a Superior Auto Adjustment mode, where the camera takes six shots in quick succession and combines them to create an image with low noise and higher dynamic range. Another feature we liked is Background Defocus, which can blur out the background and focus on the subject. Scene modes include High Sensitivity, Twilight, Twilight Portrait, Soft Snap, Landscape, Beach, Snow, Fireworks, Advanced Sports Shooting, Gourmet, Pet, and Soft Skin. The most notable is the Soft Skin mode, which recognises skin tones and reduces blemishes and wrinkles — without affecting the rest of the image. The camera takes six successive shots in Handheld Twilight mode to get a better image in low light. In Anti-Motion Blur mode, you get sharper images without a tripod. ISO goes as high as ISO 12800 in the automatic ISO setting, which helps in low-light conditions, although you can choose to limit maximum ISO to 6400. Sony's proprietary Optical SteadyShot image stabilisation tries to minimise the effects of vibrations. The DSC-RX100 is capable of shooting 1080p video. HDR photography is possible using the bracketing feature. Other notable features include Smile Shutter, which detects a smile on your subject's face, and clicks automatically at the right moment. Face Detection can distinguish between adults and children, and it can detect up to eight individual faces in a scene — to automatically make the settings for the best shot! The Anti-Blink function sounds a warning if your subject blinks when the shot is taken. The advertised burst speed is 13 per second for JPEG or10 for RAW shots, which is extremely fast (faster than many SLRs) considering the resolution. The Sony Cyber-shot DSC-RX100 starts up in around 2.1 seconds, which is slow for a camera that has other impressive specs (and, not to mention, a high asking price). The Twilight mode is useful; it gave us better images than what we usually get with expensive point and shoots. The back-illuminated Exmor CMOS worked very well under low light. Take a look at the image gallery below to see the results yourself, including the ISO performance. You can see that the sharpness decreases (and the noise increases) as the ISO is increased. But Sony has managed to keep the noise levels admirably low compared to most of the cameras we have reviewed. There is a side effect, though: You can see artefacts (appearing as a plastic-like surface) in a close-ups of high ISO shots — which is due to the excessive noise reduction. If you shoot in RAW, however, you can control the amount of noise reduction applied (but this calls for time and dedication to manually process the images on your computer). However, when compared to small sensor point and shoots, with the RX100, you'll see better ISO performance, with up to ISO 1600 being perfectly usable for most practical purposes. Sony has completely eliminated fringing in this camera; it is not visible even at maximum zoom. The camera supports full HD video with stereo sound. Videos can be captured at 1920x1080 in AVCHD format at 28 Mbps, 24 Mbps, and 17 Mbps, in the YouTube-friendly AVC MP4 at 12 Mbps (1440x1080) and 3 Mbps (640x480). You can zoom while shooting videos, and autofocus works when zoom is changed midway through shooting (something that many cheaper cameras don't support). Zooming-in is silent, but there’s a very slight motor sound while zooming-out. The camera comes with Optical SteadyShot image stabilisation using a built-in gyro sensor. The sensor detects camera shake and compensates by shifting the lens to prevent blur and preserve image quality. This is especially useful while using the zoom and while shooting videos. It performed exceptionally well when we used it, producing amazing hand-held results at 3.6x zoom (including the test shot at the start of the performance section). Overall, the image quality is impressive, and we found the colours natural. Focusing is very fast; the camera attains a perfect focus pretty much every time, all but eliminating the need for the manual focus. It is very easy to use — photography newbies should be able to learn the features and modes in a matter of minutes. The battery takes around 4 hours to charge. Claimed battery life is 80 minutes, or around 300 images. 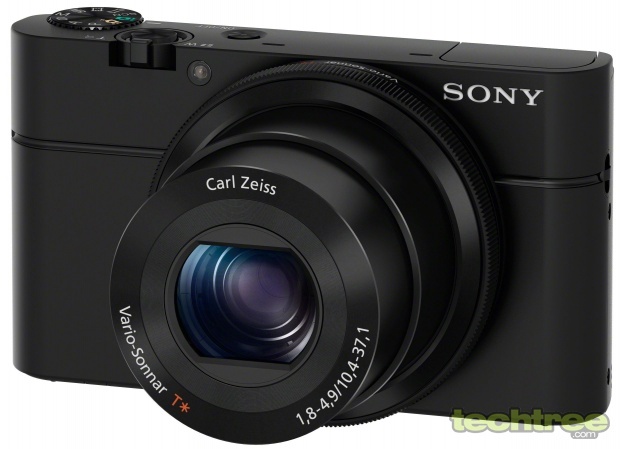 The Sony Cyber-shot DSC-RX100 is an excellent camera as far as performance and features go. The slim design, with the metallic body is stylish, the body seems rugged and yet incredibly lightweight, considering what it packs. In addition to automatic mode, the enthusiast gets full manual control with a whole bunch of features. The image stabilisation and autofocus work like a charm, and the macro mode is brilliant. Like we said, you get a good amount of detail even in low light. Full HD video capture with stereo sound, and playback on your HDTV via HDMI, is also supported. Because the body is all-metallic, however, it is hard to get a good grip. The flash sometimes doesn’t illuminate the subject evenly beyond ten feet, plus, the flash mechanism seems delicate. A minor point is that the noise reduction is excessive — the picture looks unnaturally smooth when you zoom fully into the image (at normal viewing sizes, this is far less evident). This compact camera is very easy to use for someone who has no experience with photography. Plus, it crams in a a whole lot of nifty features. The Sony Cyber-shot DSC-RX100 costs Rs 34,500 (street price), which does seem rather high for a camera that would ideally serve when your DSLR is too large to carry. The RX100 is not going to impress those who protest saying "...but for half the price I can get 20x zoom...", and it is not meant to either. It is best suited for someone who is used to clean images from an SLR, but who does not want to carry it around everywhere. So, should casual photographers consider this camera, especially if they are happy with Facebookable images coming off their cell phones? Perhaps not. Not at this price point, certainly. What if you are an enthusiast photographer with cash to spare? Pick it up.